With a stay at The Monarch in Bengaluru (Bangalore City Center), you'll be a 4-minute walk from M.G. Road and 15 minutes by foot from Cubbon Park. This hotel is 2.6 mi (4.2 km) from Lalbagh Botanical Gardens and 3.5 mi (5.6 km) from Bangalore Palace. With a stay at Bangalore International, you'll be centrally located in Bengaluru, a 2-minute drive from Race Course Road and 12 minutes from Bangalore Palace. This spa hotel is 2.3 mi (3.7 km) from M.G. Road and 3.2 mi (5.1 km) from Lalbagh Botanical Gardens. With a stay at Rishon Suite, you'll be centrally located in Bengaluru, within a 15-minute drive of Dodda Ganapathi Temple and Bull Temple. 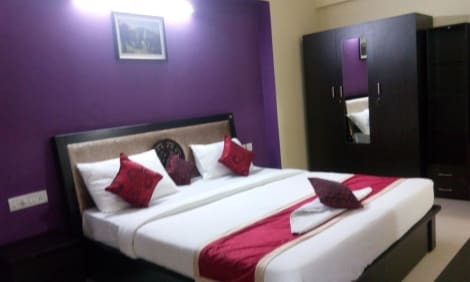 This aparthotel is 4 mi (6.5 km) from Lalbagh Botanical Gardens and 6.1 mi (9.8 km) from M.G. Road.